Telemundo is beating FOX in World Cup TV ratings battle. Burger King has apologized for an ad promising Whoppers for life to Russian women who get impregnated by World Cup players. A banknote featuring Soviet goalkeeper Lev Yashin becomes a collectors’ item. Apparently, Sepp Blatter is in Russia at the invitation of Vladimir Putin. For the Open Cup, the Union will play Orlando on Wednesday, July 18 at 7 PM in Chester. The Union will participate in an International Champions Cup youth tournament with MLS teams, Liverpool, Chelsea, and Dortmund. Curtin’s presser was yesterday. 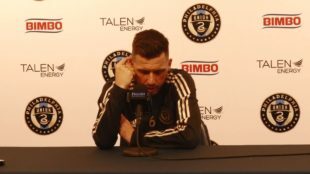 Besides Medunjanin out for two more games (three total), the Union will wear black armbands to commemorate the life of Walter Bahr on Saturday. Also, Curtin believes Red Bulls’ Tim Parker has “for me has been the best center back in the league this year.” I dunno about best, but pretty damned good. Has the ban on MLS-owned USL teams improved the Open Cup? A professor/author from Colorado examined U.S. Soccer’s 2016 and 2017 Audited Financial Statements. In the Development Academy playoffs, the Union U18s beat Shattuck Saint-Mary’s and are tired for the top of their group. Bethlehem Steel F.C. drew 2-2 with the New York Red Bulls II. West Chested United lost to Junior Lone Star FC, 1-0. Reading United A.C. beat the Ocean City Nor’easters, 2-0. Toronto F.C. signed goalkeeper Alex Bono to an extension. Allegedly, there was European club interest in him. Speaking of keepers, Orlando City’s Mason Stajduhar completed chemotherapy treatment for bone cancer. Bush-league suspension. Give Haris a break, he’s harmless. Blessing in diguise, Curtin would rather run Haris into the ground then give him a rest. not gonna lie, i’ll take it. Parker is good……one of the best players on the pitch in the OC match. Jackman has been there before and actually has a locker in the special locker room next to the Club lounge. Think he already owns some shares. Argentina looking like the Union today. Croatia, conversely, looking like the team that is going to make it a few more rounds into this thing. Based on how uncertain even the other big clubs have been, they could threaten to make the semi-finals. This isn’t on Messi. Argentina is pure crap. Caballero. Good lord. Messi was putting his heart into it. Multiple times he demanded the ball at midfield charged through 2-3 players to run into another wall of 3-4 and was just left hanging looking for runners. This loss was not on Messi at all. Croatia are a team. Argentina not so much. Croatia’s midfield is just awesome. they also have some great finishers.